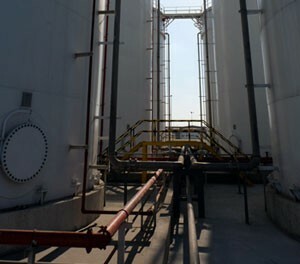 art terminal in Jebel Ali Free Zone (JAFZA) which can store up to 15,000 CBM. Our huge warehousing facility enables us to stock enough inventory and ensure uninterrupted supply of products to our customers. We have our own fleet of 40 ft trailers and tankers which help us ensure timely delivery of our products to our customers. We also do onsite blending as per the requirements of our customers and have the latest drum and iso-tank filling facilities. With our new state of the art terminal, we are better placed than ever before to participate fully in the growth and future of the chemical industry.Excellent Infrastructure coupled with our vast and varied experience in the industry make Al Nahda International FZC a highly competitive chemical distributor catering to major multinational and local industries around the region.